I am now, much more than when I was a young, a big Roald Dahl fan. 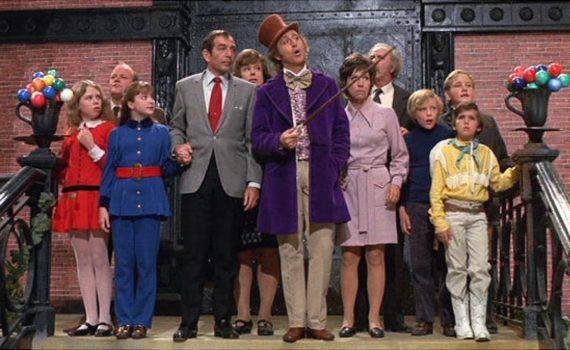 When I was a kid, my first exposure to Dahl may very well have been this film, Willy Wonka instead of Charlie, but the same wonderful, magical, mysterious story. It had been out for years by the time my sister and I got around to seeing it in the late 80s, but that doesn’t mean it had lost any appeal in the interval. On the contrary, and that’s what makes a classic a classic, it only grew larger with age and with reputation. Nowadays this film is considered one of the greatest ever made, I think I can say that with some confidence, as I show it to my children for the first time. I have to imagine it won’t be the last, since they found as much enjoyment in it as I did, and as I still do. The reclusive Mr. Willy Wonka, the world’s greatest candy man, has been shut up in his factory for years, a place that no one enters and no one is ever seen leaving. And yet, the factory runs, the chocolate pours out, and children everywhere dream of what it must be like behind those barred gates, what delicious treasures must await anyone who could step inside. But as quickly as it was closed to the public, Wonka announces that it will soon be open, but only to the lucky finders of five golden tickets, priceless passes hidden somewhere within the packaging of a Wonka Bar. For young Charlie Bucket, his poverty and his ill grandparents keep him at school & at work, never leaving time for play or for candy. But perhaps there is some magic left in the world, because as Charlie finds a golden ticket, his wildest imaginations prepare to come to life. It really is a special story, some piece of our global culture that will never grow old. And this film version is as much a classic as the book to me, something I grew up loving and will never stop. I was overjoyed that my kids saw in it the same thing I did, and I’m happy to watch it again with them dozens of times through the coming years. This film version is slightly different than the book, filled with musical numbers that have basically become legends. Add in Gene Wilder as Willy Wonka and you’ve approached perfection. Johnny Depp made a modern and much darker version of this tale, which will never compare to this 70s version, not in my book. No, the magic is here, and it always will be, I’m very thankful to say.